It surely is nice to get away from our ordinary routines for a few days. There are certain times when those that love us know better what we need than we do ourselves. Somtimes it doesn't even make sense. This last little get away to the beach was just one of those times. It's good to trust those few faithful people in our lives who have well-proven their love many times over with their steadfast care of our well being. Little did I know how perfectly timed Mr. Meems' insistence that I drop everything and take a break from all my 'doing' would be. 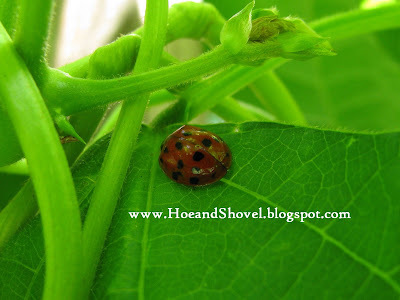 He is well aware of the challenge it is for me to leave my vegetable garden when harvesting is anticipated. Being at the beach with two of my favorite men-folk (one being a 3 year old) was every ounce renewing, rejuvenating, refreshing, and relaxing. We enjoyed every single minute together. 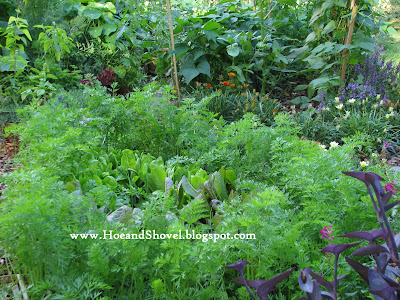 Several of you have requested the "long view" of the veggie garden. Here it is with almost all the veggie plants visible... just for you. The confederate jasmine surrounding the garden is at its peak... laden with its uber-fragrant tiny white flowers. The intensity of the sweet scent wafting throughout the garden is unmistakably heavenly. 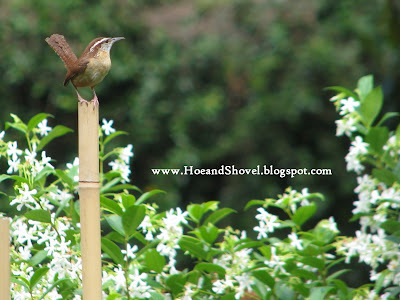 The carolina wren family born just on the other side of the fence make themselves at home on the tomato stakes fluttering in and out of the nearby shrubs. There were lots of goodies waiting to be harvested upon our return. How can it be that in just a few days of not seeing the garden it looks like it got so much bigger? Those carrot plants are serving up some shade and protection for the romaine lettuce just like I'd hoped. My little garden helper headed right out into the garden with me to help me pick the green beans and of course to wind his way through the pathways. Much excitement goes on when a new vegetable is ready to harvest for the first time. 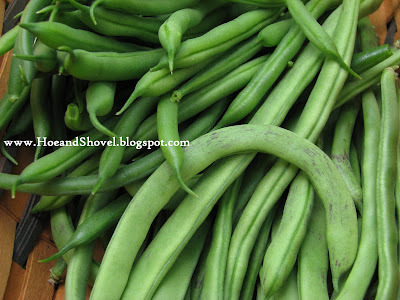 To my surprise the first of the rattlesnake pole beans were waiting to be picked. Aren't they pretty with their purple streaks! Lady bugs are my friends. 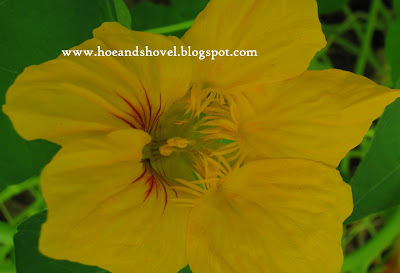 Nasturtium seeds were planted at the same time the vegetable seeds were sown in late February. It is my first experience with them. 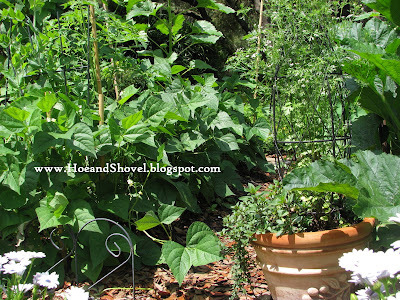 Tucking them in between the squashes, the green beans, the lima beans, and the snap peas their pretty green foliage grew rather quickly. Only they weren't blooming. Until now. All of a sudden. As is the case with so many things in a garden. But for some reason I'm just as newly energized and just as newly surprised when things in the garden actually happen as they are supposed to happen. The blooms are varied in colors of yellows, oranges, and reds but also quite inconspicuous in size and stature. They actually bloom underneath the large green leaves of the plant. Upon close inspection the intricacies of these unassuming flowers is not to be slighted by our affections. Instead this one is going on the list of must-haves for companion gardening. One more blooming plant adding to the joys of the vegetable garden. 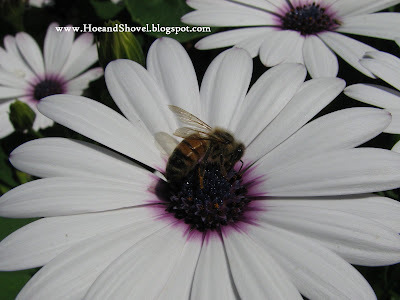 Beautiful pictures of your garden.. Of course, I love the flowers--but those veggies are making my mouth water!!!! Yum!!! When are you going to show us some pictures from the beach trip????? We are leaving for a week at the beach also.. Hope you have a wonderful week ahead. Glad y'all had an excellent time away. The veggies look wonderful. Have a great weekend. oh meems you are leaps and bounds ahead of us... we are just getting our seeds in the ground for the last week and a half. but seeing your stuff is heart warming...thinking of what is coming here. i planted nasturiums from seed yesterday as a companion with corn...so we will see. i am so glad for you that you got to get away and it was refreshing. your vegetables look so scrumptious...yummy. 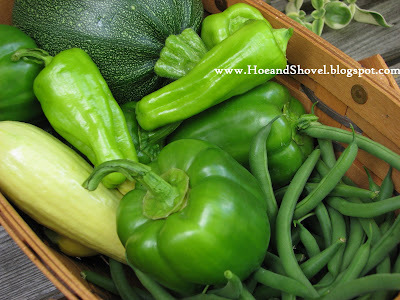 i sure hope things go as they are supposed to around here...just to harvest some fresh veggies...it is so exciting. we have had two days of heavy downpours so i hope our seeds have remained. it's too wet to tell...i will be checking tomorrow. happy may gardening. My first year with Nasturtiums too and I love them! Great post it all looks so beautiful! Meems what a pleasant surprise to come home to. It is amazing how quickly things grow when we are away. To experience the joy of harvesting from your garden is second to none, except when you plant too much LOL then it becomes a chore. But the greatest gift for me is sharing with friends, I just love to see their faces when presented with produce from the garden. Welcome back to your lovely home and gardens! I can't imagine enjoying a garden harvest this early. 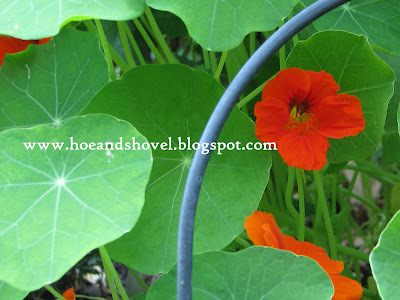 Good report on the nasturtiums. I have been thinking about trying those for the flower garden to see if they are deer resistant (I'm always up for an experiment). There's a pair of Carolina Wrens building a nest this morning -- in the hanging basket that I made with nectar plants for the hummingbirds! I have to figure out how to set up watering for it without disturbing the nest. The Musician thinks one of those water bottles that drip will do the trick. We're leaving Monday and will be gone a week. I'll catch up when we return. 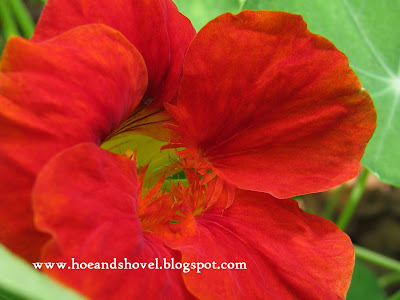 Love your Nasturtiums wow! Those carrots look yummy. Our carrots and turnips are just starting to show the tubers. How exciting to come back to such bounty from your garden. I am amazing at how much everything has grown just since we were there. Two of my tomatoes are in big pots on the porch and doing great - John is preparing a small area just outside porch for the others. 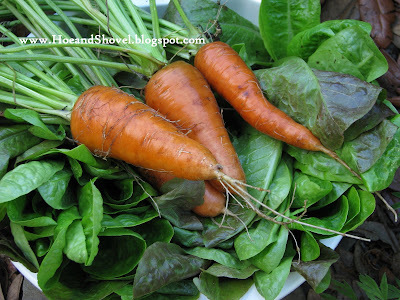 Are there any other veggies that you can plant at this time of year? Meems, it is good to see you at home enjoying that gorgeous prolific garden again. Isn't it just the best to go away and then come home to such a luxurious garden!? Just love that long view. Your vegetables look so healthy! I'm so glad to see you involving your son in the garden where he can learn where food can actually come from. And not from a can or the grocery store! What a wonderful legacy. 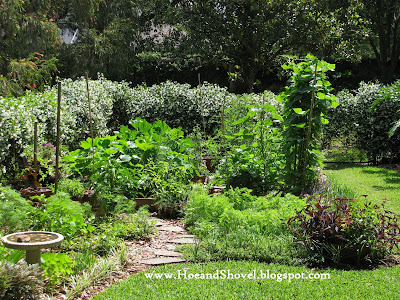 It's always great to see how much the garden has grown after being away for a few days. Nice harvest! Confederate Jasmine makes a beautiful wall for your vegetable garden. The fragrance must have also called you back to your garden. Jasmine is hardy through zone 7 and used in Atlanta gardens. In Italy they use it extensively and elaborately for walls and ceilings in their outdoor rooms and cafes trellised in many shapes over iron work. Here we mostly use it to cover chain link fence and I for one wish we would do more of it. So glad you enjoyed your time away! Your garden is lovely, as always and what a nice harvest. 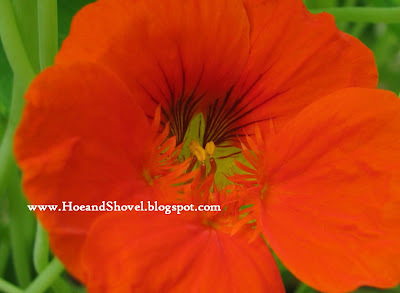 Throw a few of those nasturtium blossoms in your salad...I love their spicy taste! Your veggies look so good. It's only 9am here but I'm craving a salad. It's hard to believe we don't even have anything planted here yet. Meems that garden is GREAT!